Prednisone does such weird things to me. And, as I have wah wah wah-ed a zillion times before, the prednisone weirdness usually involves food. Today's pred adventure was a bit unusual, though, in that it did not involve sugar or flour or wheat. So at two days post rituximab, I'm up and doing stuff, especially since my pred is temporarily bumped up for a week. But I am still living within some pretty tight energy restraints, so I have to choose my activities carefully. Well, I should choose my activities wisely, but of course this means that I don't. Washing my hair? Doing some laundry? Nah. Once I become obsessed with some kind of prednisone induced project, the focus is always food. Sigh. My food obsession today involves a three pound beef roast that has been sitting in my refrigerator for the past two days, just begging to be cooked in some delightfully unusual way. This is very, very weird for me. Although I enjoy being a carnivore, I really can't say that I have ever craved a roast before. Ever. So I spent every last ounce -- inch -- how DO you measure energy, anyway? Kilocalorie? -- combing the internet for a recipe and preparing this thing. At this writing, I have no idea how it will all taste, but so far, it's smelling pretty darned good. The recipe involved slicing, dicing, searing, braising, browning, and mincing. I also needed to learn how to and actually make a bouquet garni, which did turn out pretty danged awesome, if I say so myself. But even as I was patting myself on the back for actually putting this concoction into the oven, I also realized that absolutely nothing else was going to be accomplished, since by the time I closed the oven door, I was bathed in perspiration and wobbly as heck. So. I'm camped out on the couch for the remainder of the day, but I'll be eating BEEF for dinner, by golly. And at this point, nothing else matters. Wonder what tomorrow's obsession will be? Here's the recipe for what I'm thinking should be called "Steroid Steak". Or something beefy like that. I make no claims about the deliciousness of the recipe, but I'm optimistic. Found on Magnolia Days, here. Preheat the oven to 325 degrees F. Cut the beef into slices about 2- to 4- inches long, 1 -inch wide, and 1/2 inch thick. Lay beef strips on paper towels and cover with another layer of paper towels to dry them. In a large skillet or saute pan over medium-high heat, add a thin layer of bacon fat or oil and heat until almost smoking. Brown the beef slices quickly and in batches. Do not crowd the pan. Set browned beef aside in a bowl. Reduce heat to medium and add the sliced onions. Add more fat or oil if needed. Cook the onions for 10 minutes, stirring frequently. Remove onions from the heat and season with salt and pepper. Add the garlic and stir to combine. In a 9- or 10- inch dutch oven or heavy pot, place 1/2 of the beef in an even layer and season lightly with salt and pepper. Cover the beef with 1/2 the onions. Repeat beef and onion layers. Pour any accumulated juices from the beef into the pot. In the browning skillet over medium heat, at the stock. Heat the stock and scrape the pan to get up any browned bits on the bottom of the skillet. Pour the heated stock over the beef. Add enough beer to barely cover the beef. Stir in the brown sugar. Wrap the parsley, bay leaf, and thyme in cheesecloth. Tie it with cooking string (makes an herb bouquet, or bouquet garni). Bury the herb bouquet in the beef. 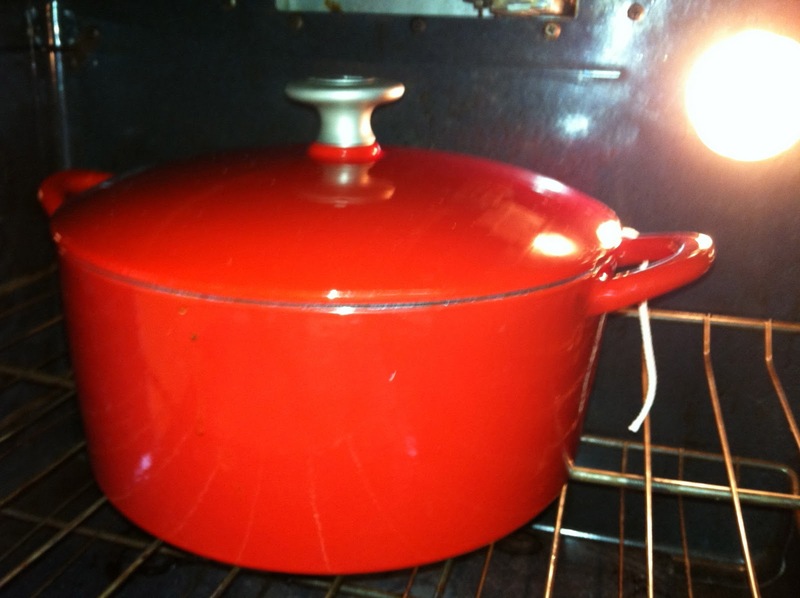 Over medium-high heat, bring the contents of the dutch oven to a simmer. Cover and place it in the oven. Cook it in the oven for 2 1/2 hours. Remove and discard the herb bouquet. Use a strainer over a large bowl to drain the liquid out of the dutch oven. 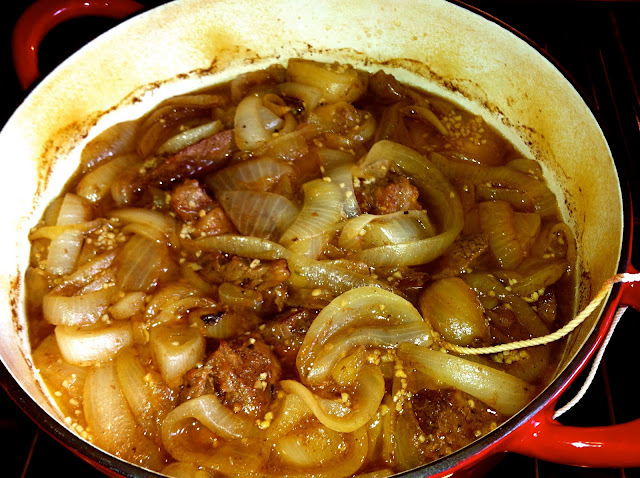 Return the beef and onions to the dutch oven. Pour the liquid into saucepan and skim off the fat. Heat the liquid over medium heat. In a small bowl, stir together the cornstarch and vinegar. Slowly pour it into the liquid, whisking constantly. Bring the liquid to a simmer. Turn the heat to medium low or low and simmer for 3 to 4 minutes to slightly thicken the liquid. Pour the liquid into the dutch oven. Serve immediately with buttered noodles or potatoes. Garnish with fresh parsley if desired. This is a technique for cooking beef I've never seen in any recipe before, but looking at the ingredients....beef,some fat,beer, onions,etc. it sounds awesome, and I bet the taste will be really delicious. My guys would eat this, especially,over noodles or potatoes. Enjoy the fruits of your hard labor, Julia. I don't think it's the prednisone. I get the same cravings, earlier this week was Chicken and Dumplings, today it's Eggrolls. Hey everyone -- this was very good BUT make certain to use a pilsner style beer; and don't over-estimate the amount of thyme in the bouquet garni.